" Articles from: October 2013	"
It is becoming increasingly obvious that the Supreme Court decision in Shelby County v. Holder, which eviscerated the Voting Rights Act, is leading to a new era of voter suppression that parallels the pre-1960s era—this time affecting not just African-Americans but also Hispanic-Americans, women, and students, among others. The reasoning employed by Chief Justice John Roberts in Shelby County—that Section 5 of the act was such a spectacular success that it is no longer necessary—was the equivalent of taking down speed cameras and traffic lights and removing speed limits from a dangerous intersection because they had combined to reduce accidents and traffic deaths. I won't be surprised if history finds the Shelby County ruling, along with Citizens United, to be right up there in the Dred Scott pantheon of terrible rulings by a U.S. Supreme Court. That both occurred within years of each others on the John Roberts Court speaks volumes --- and does not bode well for whatever may still be to come. IN TODAY'S RADIO REPORT: Students disrupt Obama's healthcare rally to protest Keystone XL pipeline; Koch Brothers' pipeline spills in Texas; BP's toxic oil spill still hurting Gulf fishermen; Spain's remarkable solar record; PLUS: Stanford University confirms: Renewable energy can provide 100% of the world's energy needs ... All that and more in today's Green News Report! 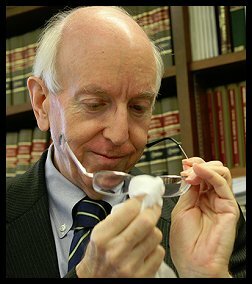 If you haven't been able to follow Reagan-appointed federal appellate court judge Richard Posner's stunning disavowal of his landmark 2007 polling place Photo ID law ruling - from admitting he got it wrong a few weeks ago...to unconvincingly unadmitting it this week --- I'd hardly blame ya. 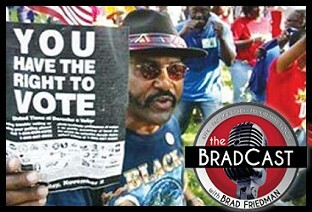 On this week's BradCast on KPFK/Pacifica Radio, I tried to help make sense of the Photo ID Posner Coaster, as much as possible, and explain where it leaves the continuing fight against the ramped up GOP voter suppression in this country. We also covered the criminal charges recently filed against repeat offender Diebold (for what the U.S. Attorney described as "a worldwide pattern of criminal conduct"); the new way that KS and AZ have come up with to keep legal voters from voting; and, with NJ Gov. Chris Christie up for re-election next week and taking a bow for his post-"Superstorm Sandy" performance one year ago this week, it seemed a good time to revisit the secret Koch Brothers audio tapes we revealed in 2011, when Christie was lauded at a secret Koch Brothers meeting in Colorado, where brother David introduced him proudly as "my kind of guy", among other praises sung. With New Jersey Gov. Chris Christie (R) up for re-election next Tuesday, we've been getting quite a bit of traffic here from Mother Jones where I originally broke my series of exclusive reports on audio recordings from inside the Koch Brothers' secret 2011 Summer Summit near Vail, CO that year. As a quick reminder of what was heard on those tapes, and what happened there, Christie --- literally --- had snuck out of New Jersey to fly to Vail for the day to perform as the keynote speaker at the super-secret Koch Brothers gathering with a few hundred very select Republican millionaires and billionaires who were meeting to plot what Charles Koch described to the assembled as "the mother of all wars...for the life or death of this country." That, along with comparing President Obama to Saddam Hussein, was how he described what would be their fight for the 2012 Presidential election. Billionaire brother David is heard introducing Christie at the event as "my kind of guy", describing him as "a true political hero". He boasted that he'd met with Christie secretly, not long before, "for about two hours --- just the two of us," in David Koch's New York City office, and that he was hoping the NJ Governor would some day have "a larger stage where, God knows, he is desperately needed." Christie's surprise withdrawal from RGGI was met with great applause in the banquet hall in Colorado, as well as from Rightwing climate change denialists when it actually occurred. 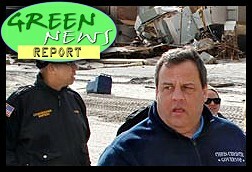 He pulled out of the landmark pact just weeks after Koch and Christie had their secret meeting in New York City, a little over a year before the global warming-linked Sandy would result in the loss of more than a hundred citizens and billions of dollars worth of damage. After we published the secret Koch tapes, Christie would claim that he never discussed RGGI with the Kochs --- it "never came up", he said --- though the Director of the NJ Sierra Club told me that Christie should not be believed. 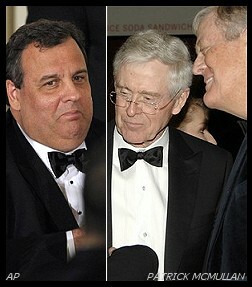 As to Christie's secret speech itself that night in Colorado --- the security for which was so extreme there were speakers set up around the perimeter of the dining hall to pump "pink noise" into the mountainside to stymie long-range parabolic microphones --- the NJ Governor delivered a stem-winder to the Kochs' assembled high and mighty. He bragged about how he'd fooled Democrats in the state legislature into supporting massive cuts to state pensions, and how he'd planned next to "take on the teachers' union once and for all." The full audio and text transcripts of the remarks by Charles and David Koch, as well as the speech by Christie, are posted in full here, in case New Jersey voters would like to review the record before heading to the polls next Tuesday. The full series of stories and their fallout can be perused here. New revelations and global protests by ordinary citizens and world leaders --- including U.S. allies --- over NSA surveillance, have now settled into an almost daily affair. In the meantime, during an interview on Democracy Now! this week, journalist Glenn Greenwald offered up an analysis that may help explain what he now describes as an "institutional obsession" with surveillance by the U.S. government. 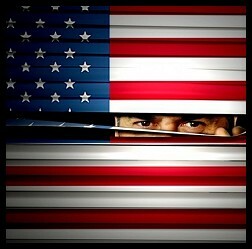 "If you reveal to populations around the world that their calls are being spied on by the millions, they’ll first wonder, 'Why are my calls of interest to the U.S. government? '," Greenwald observes. "But when it becomes apparent that the United States government is doing this for economic advantage, they start to feel personally implicated, like they’re being actually robbed." IN TODAY'S RADIO REPORT: One year later: the lessons of Superstorm Sandy - Scientists question rebuilding in coastal areas, warn of future climate impacts & of sea level rise; PLUS: It's official: the Poles are having a heat wave! 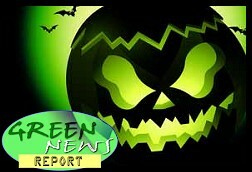 (No, not the Polish people) ... All that and more in today's Green News Report! Okay. Now this is beginning to get completely absurd. 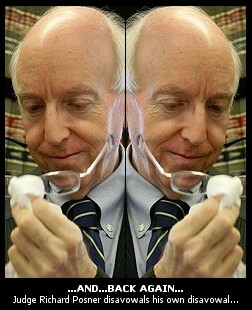 In an article at New Republic headlined "I Did Not 'Recant' on Voter ID Laws'," published Monday, 7th Circuit Appellate Court Judge Richard Posner now claims he hasn't actually disavowed his landmark majority opinion in Crawford v. Marion County Election Board after all! The record will show, however, the Reagan-appointed judge may have a bit of a faulty --- or, at least, selective --- memory. The Crawford case is the now-infamous 2007 challenge to Indiana's then new polling place Photo ID restriction law which Posner voted to uphold in a 2 to 1 decision. The law was subsequently upheld by the U.S. Supreme Court in 2008. It is the only high-profile case to uphold such laws as Constitutional, even though Justice John Paul Stevens, who wrote the controlling opinion at SCOTUS, now believes dissenting Justice David Souter "got the thing correct." 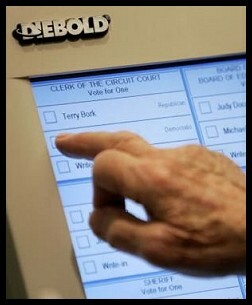 Perhaps predictably, the Rightwing is now turning on the otherwise well-respected, Reagan-appointed appellate court judge who recently admitted his majority opinion in Crawford v. Marion County Board of Elections (2007), the landmark polling place Photo ID restriction law case, "was wrong." Sergio Munoz at Media Matters details the recent --- and, frankly, absurd --- attacks being leveled against Judge Richard Posner by such outlets as National Review Online and long-time discredited GOP "voter fraud" fraudsters like Hans von Spakovsky. But I want to highlight a point or two that I haven't been able to cover previously on all of this, including comments given to The BRAD BLOG by one of the Democratic Party's lead attorneys on the original case, after what he describes as Posner's "stunning" admission. A headline in the bi-monthly magazine, Pacific Standard declares: "The Scientific Debate About GM Foods Is Over: They're Safe". The article cites multiple scientific journals and governmental organizations to support the assertion. 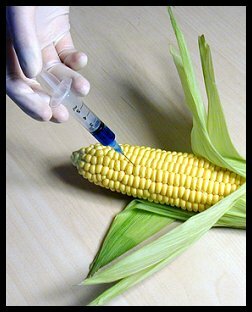 Anyone reading the article might assume that, like global climate change, there is a consensus within the scientific community that food made of genetically modified organisms (GMOs) are perfectly safe for human consumption; that there's no need for a debate; that the now-pending initiative to require GM foods to be labeled as such in Washington State is just silly. After articles like the one offered by Pacific Standard --- and a $17.2 million ad campaign by Monsanto and the Grocer's Manufacturing Association --- enough Evergreen State voters are seemingly now convinced that there is no need to label GMOs that pollsters have declared the initiative "too close to call" at the moment. Why, after all, should we bother to label food in the face of a scientific consensus that GMOs are perfectly safe? When Don Yelton, North Carolina Republican Party Executive Committee Member and GOP Precinct Chair of Buncombe County, NC tried to explain to The Daily Show that the state's new polling place Photo ID restriction law wasn't racist at all, things went from bad to worse. Yeah. Pretty amazing. In an interview with Mountain Xpress after the show aired Wednesday night, Yelton said he was pleased with the way the Daily Show had edited the conversation. "The comments that were made, that I said, I stand behind them. I believe them," he told the paper. "To tell you the truth, there were a lot of things I said that they could’ve made me sound worse than what they put up." But the Republican Party --- currently fighting in court to support the most restrictive voter suppression law to be passed in the nation since the Jim Crow era --- is not quite as pleased. The Buncombe County GOP said in a statement on Facebook, that "Mr. Yelton’s comments do not reflect the belief or feelings of Buncombe republicans, nor do they mirror any core principle that our party is founded upon." Speaking to Pete Kaliner, host of "The Pete Kaliner Show" on WWNC 570 AM, Yelton has officially resigned from his position as precinct chair within the Buncombe County Republican Party. Nathan West, Communications Director of the Buncombe County GOP, told Salon over the phone that he is worried about the "artificial damage" Yelton has caused the party. Gawker reports that Yelton has now also stepped down from his state Republican Party leadership position as well. Moral for Republicans: It's okay to think it and pass laws based on it, just don't say it out loud, please and thanks, and certainly not in front of a TV camera! 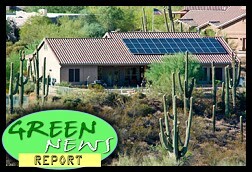 IN TODAY'S RADIO REPORT: Arizona electric company's secret plot to kill solar industry; Hawaiian island rejects being a testing ground for GMOs and pesticides; Washington State fighting GMOs, too; Another U.S. city breaks up with coal; PLUS: Warning: fossil fuels may not be a good investment ... All that and more in today's Green News Report! Conspiracy theorist Alex Jones' conspiracy theory website InfoWars decries "tin-foil hat"-wearing "nut-jobs" for citing a "nefarious conspiracy" and "baseless theories" for which "there is no actual evidence." 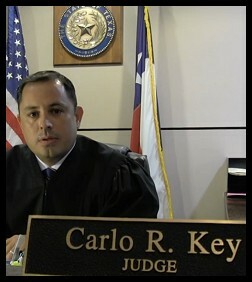 After what he describes as the Republican Party's victory of "pettiness and bigotry" over "pragmatism and principle", Bexar, Texas County Criminal Court Judge Carlo Key has decided to leave the GOP to run next year as a Democrat instead. In a video posted to his website, Key, who was first elected in 2010, echoed and reversed Ronald Reagan's explanation for leaving the Democratic Party to become a Republican in 1962. "Make no mistake," Key says, "I have not left the Republican Party. It left me." 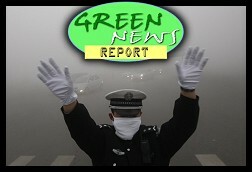 IN TODAY'S RADIO REPORT: China choking on toxic air; Air pollution causing lung cancer everywhere; Anti-fracking protests spread across Europe...and turn violent in Canada, while France holds the line; PLUS: Some good news: US carbon emissions falling for the 5th year in a row ... All that and more in today's Green News Report!